Upwork, the largest freelance website resource in the U.S., is offering help to well-known figures including President Trump in a humorous new OOH Campaign. Posters running in New York, Chicago and San Francisco including one inquiring if the POTUS needs a social media strategist, as well as another execution offering The Rock help with launching a potential presidential bid (we wonder if Oprah could follow). There's also an ad asking "Game of Thrones" author George R.R. Martin if he needs ghostwriter help finishing his next saga, and another asking Tesla's Elon Musk if he needs "a personal assistant, or eight," as he's "pretty busy." One of the wittiest, however (and saddest), is the one that reads: "Hey Blockbuster! Never Mind." 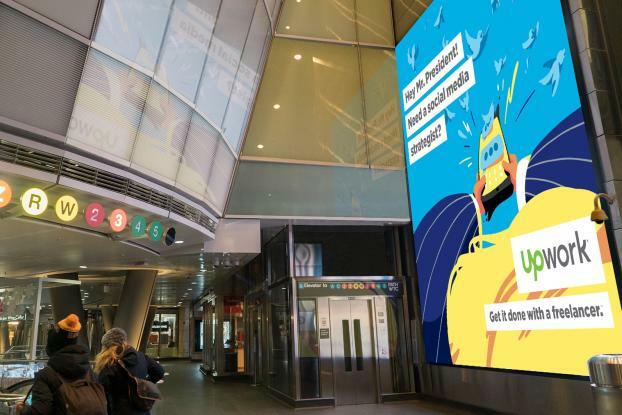 The ads are the first work for Upwork by agency Duncan Channon, and the integrated campaign includes OOH and animated digital videos produced with Gentleman Scholar, as well as radio and station takeovers at the all-digital Fulton Center in Lower Manhattan and San Francisco's Montgomery Street station.